We love pumpkin things around here. Well, the kids and I do. My husband….not so much. He’ll occasionally eat the pumpkin muffins I make, but besides that he’s not really down with pumpkin spice everything. He has been known to say that pumpkin spice lattes taste like a candle. I’m not sure why he’s eating candles and knows this, but he’s wrong. Pumpkin spice lattes are amazing. In fact, pumpkin spice anything is amazing. But that’s just me. And my kids. I’ve trained them well. At any rate, even my husband ate and enjoyed these chocolate chip pumpkin muffins. So I’m fairly confident when I say that your whole family will likely enjoy these muffins. Even if pumpkin isn’t your favourite thing in the world. 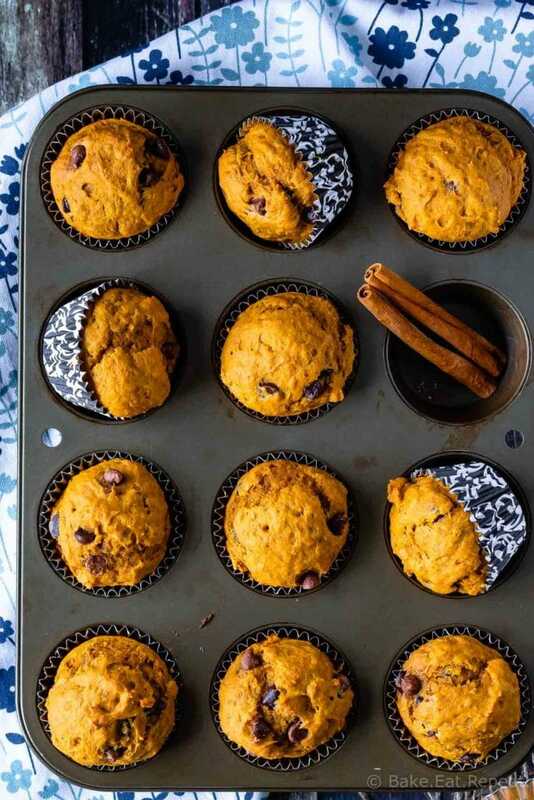 These chocolate chip pumpkin muffins are the perfect breakfast or snack for the fall. Soft, tender, and full of flavour, they’re absolutely delicious. And I’ve even included some options for making them healthier if you’d like. I never mentioned omitting the chocolate chips though….because in my mind, that’s not really an option. 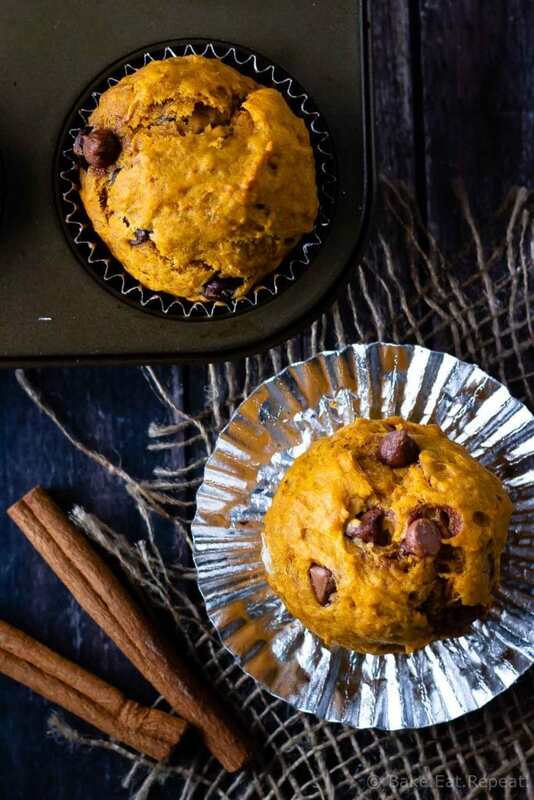 If you’re using fresh pumpkin for these chocolate chip pumpkin muffins instead of canned pumpkin it will still use the same amount. Do make sure to strain your fresh pumpkin before baking with it as it has a lot more liquid in it then canned pumpkin does. It doesn’t matter quite as much for something like chocolate chip pumpkin muffins, but if you’re making pumpkin pie it won’t set up quite as well if you don’t strain it well. 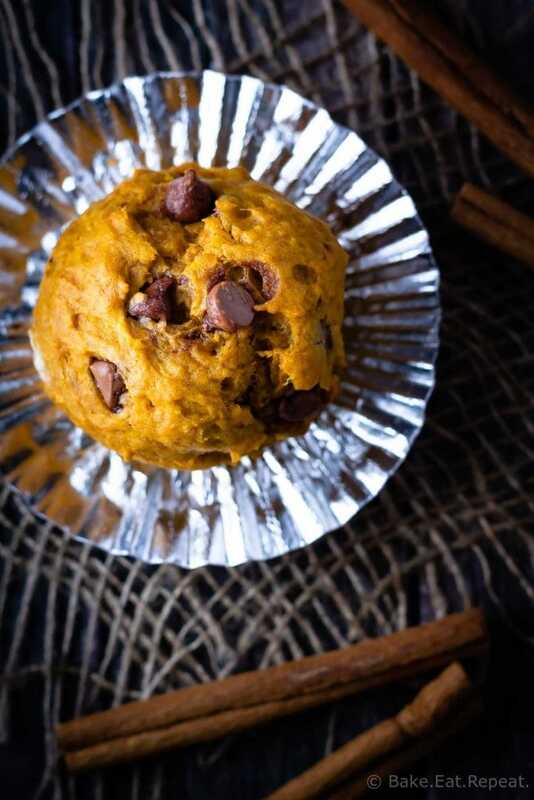 This recipe, like most chocolate chip pumpkin muffins recipes, calls for pumpkin puree. Pumpkin pie filling is already flavoured with all the spices for pumpkin pie, so these chocolate chip pumpkin muffins will not taste the same if you use that. I like to use an ice cream scoop to portion the batter into the muffin tin. It’s a quick way to end up with the same amount in each muffin cup, and it helps with getting that nice domed muffin top. If you want to make these healthier there are a few options. You can use half whole wheat flour. You can also omit the oil altogether and replace it with more yogurt, or use 3 egg whites in place of the 2 whole eggs. And I suppose you could omit the chocolate chips. But don’t. Here are a few more fantastic pumpkin recipes for you: Pumpkin Spice Muffins with Crumb Topping, Pumpkin Snack Cake with Cream Cheese Frosting, and Apple Pumpkin Bread. 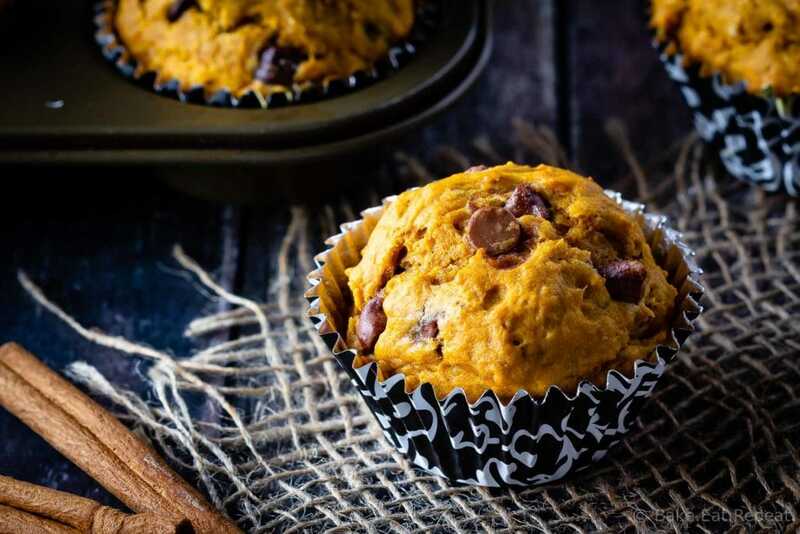 I’ve also shared this Chocolate Chip Pumpkin Muffins recipe over on Food Fanatic.